Step 1. 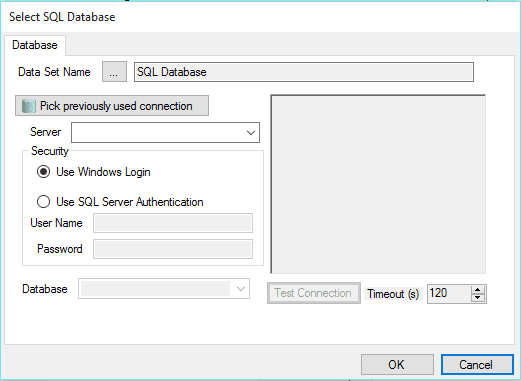 Select “SQL DB” from the New Source menu; the connection dialog for an SQL database will appear. Step 2. Provide server connection. Step 3. Provide your security credentials using either Windows Login option or SQL Server Authentication. Step 4. Select a database from the list. Step 5. Optional: test your connection by clicking the “Test Connection” button. Click “OK” to connect to the SQL database. Step 6. Select the database table(s) or view to import. Alternatively, write an SQL Query to get the data. Step 7. Optional: uncheck “Include all columns”, and check box to specify which columns to include in your query. Click “OK”. 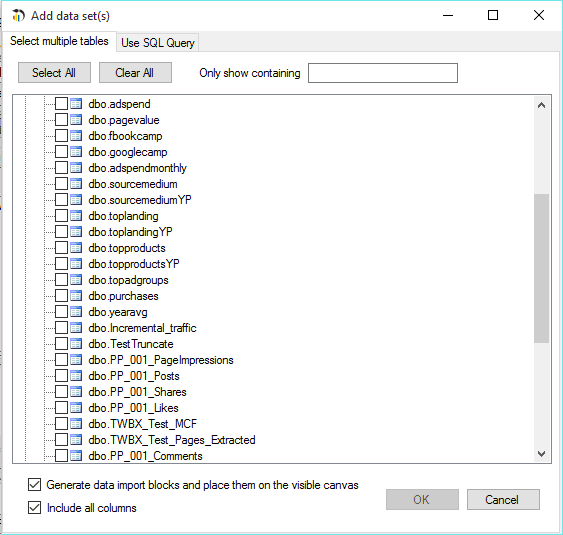 SQL Database import block will appear on the Main Canvas.